How to count rings on fruit tree wood, as experienced by Bernwode Fruit Trees in their conservation and research work. Tree ring counting, to date old fruit trees. We know fruit trees can live to considerable ages and other articles on this website go into detail about the potential age of trees. 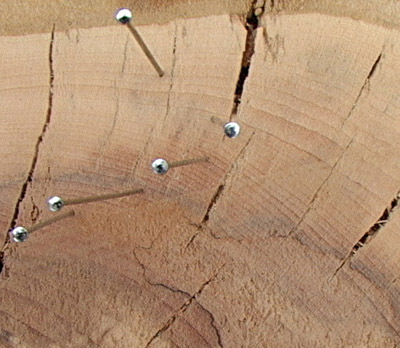 In pursuit of the oldest trees, and to push the dates further back, we thought it might be helpful to fellow enthusiasts to record our experiences of tree ring counting and offer a few tips. The trouble with dating old fruit trees, particularly apples, is that they tend to go hollow in old age, partially or wholly losing the ring evidence. Carbon dating is not possible because the timescale is too narrow for accuracy over recent centuries and it only becomes accurate for wood formed before the latter part of the 17th century. But when the trunk is largely intact and the tree has come down or died, the use of ring counting is a relatively simple, inexpensive and accurate method to date a tree. Core sampling can be very effective, if the tree is still standing and living, but does come at a cost with the need for professional sampling and counting. Though it should not damage the tree if competently done, there is always the worry for an owner that it might. We should say at this point that we most definitely do not recommend cutting down living trees, even if very decrepit. Even when a fruit tree has fallen over it can still be encouraged to re-root and re-grow, by mounding soil around the fallen trunk. Apples, particularly, keep moisture and life, even when detached from their roots, and grafts can be taken to produce new trees, so please don't be over-eager. If it is truly dead and not hollow – why not have a go at counting the rings? Sometimes a whole bough might break off of a tree, leaving the tree healthy and viable. The bough can also be sectioned for ring counting and, if it is likely to be one of the earliest formed boughs in the life of the tree, ring counting will give a date very close to the date of the tree itself. Such boughs would normally be only 3-10 years later than the age of the tree. Being hollow up high does not necessarily mean the trunk will be hollow low down, but it often is. 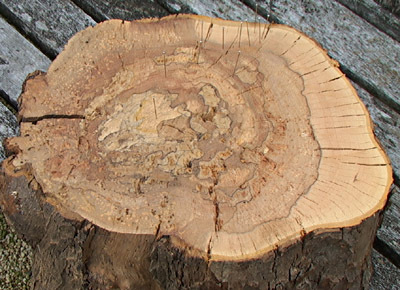 There can also be pockets of decay within the trunk and soft spongy areas, usually the result of water getting in from hollow branches above. Photographs below show both of these impediments and also areas of discoloration that can reduce the visibility of rings. Nevertheless, with the right approach, the rings can often be counted. If it is not stating the obvious, a ring corresponds with one year’s growth of the tree, the outermost being the most recent. Do not include the bark which can, on occasion, also reveal tightly packed rings. When growth conditions are good, with enough moisture, light and warmth, the rings will be wide. In lean years the rings can be very close, and easily missed without the aid of a magnifying glass. 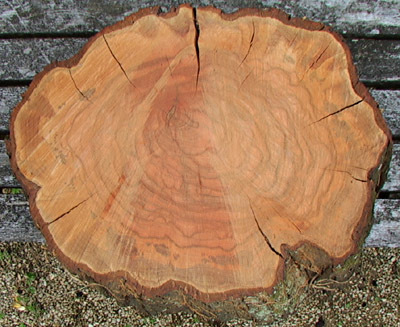 Dendrochronologists and meteorologists can glean sophisticated climatic data from such variations in sequences of rings and can then use the sequences of ring spacing to date fragments of old wood. Although we do not believe anyone has yet done this with apples or other fruit trees, it might well be possible to date a tree from the inner trunk if this remains intact and the rest is lost. The first tip is to cut the section of trunk as cleanly and flatly as possible. Usually a chain saw would be used and it will save a lot of time later if the cut is as level, even and smooth as possible. The section will need to be sanded finely and a rough uneven cut will need a lot of sanding and will make the use of a flat sanding machine difficult if the face is uneven. A sharp hand saw would be better, but a lot more work. The second necessity is to allow the wood to dry out. Even if dead, apple wood seems to absorb moisture from the air when outside and with dead trees there might well be significant rain penetration that must be allowed to evaporate. This can take several days in the dry and warm. Do not be too concerned if cracks start to appear, moving in from the edge. This will not become so serious that ring counting is compromised. The third stage is the sanding. If you have an electric plane, then you can save a lot of time, but use it on a very shallow setting. It can be a long and arduous job sanding by hand (unless the section has been cut with a very fine toothed saw) and you might prefer to use an electric sander. Having tried both methods, we think hand sanding is better, unless you have a powerful professional sander. If you plan your route across the section of wood for the ring counting avoiding any soft or decayed areas, you will often find that a relatively small part of the section actually needs sanding. Initially you might not be able to see the rings at all, before sanding. You will know when you have sanded enough and the rings are fully revealed. You should then dust off the surface and wipe it thoroughly with a wet cloth, several times. Leave it to dry! Do not be temped to use oils to bring the rings out. It doesn’t really work and you would then have to sand all over again. The rings will now be visible where the wood is solid and undecayed, but there might be areas where the wood has gone pulpy or even hollow. Plan the ring counting, hoping to go around decayed areas and pick up the rings again further round. Often, in the very centre of the trunk the wood will be pulpy and the sanding will have left it slightly depressed, with no rings visible. These areas can often be made to reveal their rings by wetting the wood and using an obliquely shining light on them. They come into relief and can be counted separately, the rest being counted when dry. We have found the best way to avoid losing count is to use dressmakers’ pins. Counting from the centre outwards, put a pin into a ring at every ten, then count up the pins at the end. Good Luck. 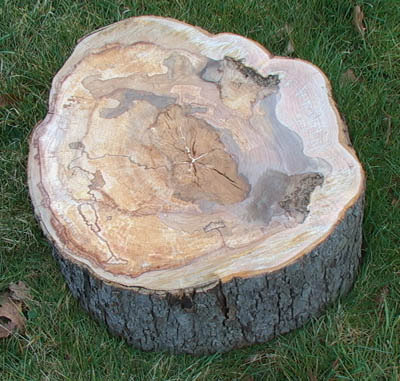 If you should come up with a tree ring count of 150 plus, please do let us know. A section of an old apple tree that blew over in the possession of Mr and Mrs Stephen Ciampi, near Princes Risborough, Buckinghamshire. The trunk varied between 16 and 18 inches in diameter. The photo( right) shows that two pockets have gone hollow and the central core was pithy and soft. This core revealed its rings by being wetted and with the aid of a light shining sideways. The staining did not interfere with the visibility of the rings. The colour, visibility and spacing of the rings can vary enormously. This tree (left and above) had several good recent years of growth. The rings become visible only with fine sanding. 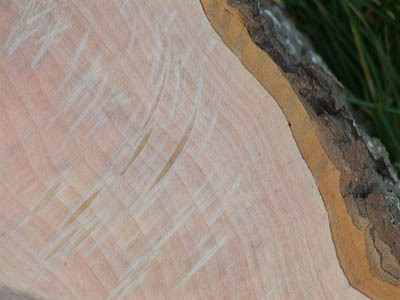 The bark shown here, both rough and light brown, does not count as a ring! This section of Plum (left) came from a mysterious line of plums in the ownership of Rob and Lorna Arthur, at Waterstock, Oxfordshire. Very large trunks had died and given rise to suckers which are now, themselves, very substantial in size. At 18" across at its widest point, this section from the dead trunk suggested a very old plum tree, with most plums not attaining the same girth as apples, pears and cherries. The rings showed the age to be 65, which was a surprise for such a stout trunk. It also put the date of origin at the end of the second world war, which was not a time when any significant number of fruit trees was planted. Since this tree had been dead for a few years, its origin was probably during the war, when almost no fruit trees were planted. Close examination of the rings for the first years of growth revealed that it was thick in its first year, and probably arose as a vigorous sucker from a failing plum tree. That sucker grew over 65 years and then gave way to a new generation of suckers, which are now substantial. Plums were often not grafted by past generations since plums, unlike apples and pears etc., can be rooted from cuttings or separated as layers, from suckers of trees which were themselves not grafted. Therefore, old varieties of plums which die off and then produce suckers from the roots might live on in the suckers and these should not be discarded as 'mere suckers' when appearing in old orchards. The same applies to hazel nut trees/bushes. The sections (right and above) were only sanded over a narrow area, since the rings were intact in a straight line, without soft areas that would otherwise have required deviation. This section (left and below) came from Mike and Jenny Senior, at The Lee, Buckinghamshire. It was from the last old tree of Long Reinette known, which died a couple of years ago. Perhaps it was the same tree that provided fruit for the 1883 National Apple Congress at Chiswick, since it was recorded that fruit was sent from Lee Manor, where this tree grew. It presented a challenge to follow the rings throughout the trunk, as the wood was spongy and deacaying over quite a large area, but the rings revealed the age to be 120 years old give or take one or two uncertain rings. It is therefore unlikely to be the same tree that bore the fruit that went to Chiswick. It is still a matter of uncertainty whether really old trees actually stop growing at some point and stop producing rings, yet stay alive. This shot illustrates well the variability of spacing in rings. 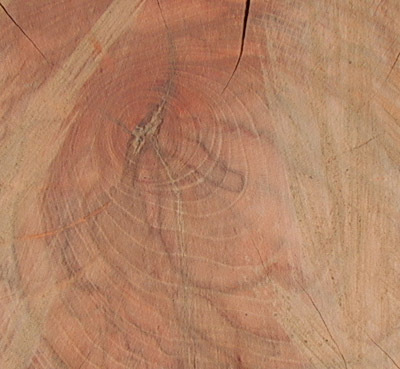 At the lower left of the picture the rings are quite widely spaced, showing that the tree was growing quickly under favourable conditions, albeit in middle age. In the middle of the photo, the tree had started to struggle for growth and that continued for about 20 years. It then started to grow faster, as the wider rings at upper right show, but there is need of a note of caution. If you look at the left margin, the rings are more evenly spaced over the same time period. A wide ring space on one side of the trunk might be quite thin on the other. Why this should be is unclear, but might be due to the removal of a tree nearby and consequently more sunlight received, or the fruit tree itself might start leaning, or perhaps rain and wind direction that year were different. More research is needed. One last tip. If we had not sanded very finely, we could easily have missed some very tightly packed annual rings.